Automatic systems of fire warning over public address and evacuation control systems are intended for warning people, staying in the building, of fire or any other emergency situation, as well as for evacuation control. Moreover, during its standby operation, such systems, installed in shopping or business centers, can perform other tasks: broadcast music in the background, advertisements or official notices to the different premises of the object. In case of receiving of alarm signal from the fire alarm system, the automatic system of fire warning interrupts the broadcasting and starts announcing recorded emergency message. Otherwise, this message can be announced by system supervisor. The priority of fire warning during broadcasting is obligatory for any warning system. Depending on the object's scale and fire safety regulations, analog or digital warning systems are used. Specialists of the BK Company offer equipment BOSCH for mounting. 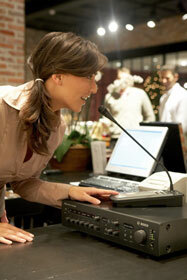 In particular, digital system Praesido and analog one - Plena Voice Alarm Systems are offered. Warning system Praesidо - is the first in the world digital multifunctional warning and evacuation control system with infinite possibilities and perfect sound quality. It is capable of working continuously under any conditions at the most important sites. It has modular architecture and a lot of system elements. It is self-testing and is suitable for unlimited extension. All elements of Praesido are connected by fiber-optic cable, tied into a net, can be configured by any network computer and provide remote access for adjustment and management by dint of Ethernet by protocol TCP/IP from standard Internet browser. This system is compatible with other BOSCH systems, as well as with equipment of other producers, including dispatch, fire alarm and extinguishing systems etc. For small and medium offices, hotels, shops, sport and educational establishments the Plena Voice Alarm System is intended. Its main features are reliability, easiness of mounting and control, possibility of extension and functionality. Due to large quantity of modules, it is possible to choose functions necessary for user. This helps to cut down expenses considerably. But it is possible to extend the system if necessary. 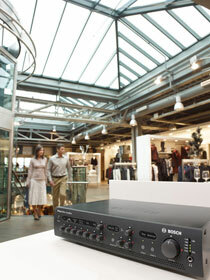 Plena Voice Alarm System automatically monitors current status of its elements, including control of loud-speakers line. Unsatisfactory system report is done by means of indicator lamps and in case of break down of one of the amplifiers, the system automatically switches to reserve ones. So long as warning systems are integral part of fire safety systems, its correct design and mounting , taking due account of all peculiarities of the object and of current regulatory documents, are very important for protection of your staff and visitors in case of fire. In addition, during standby operation, such systems create pleasant atmosphere, due to music and timely received messages.